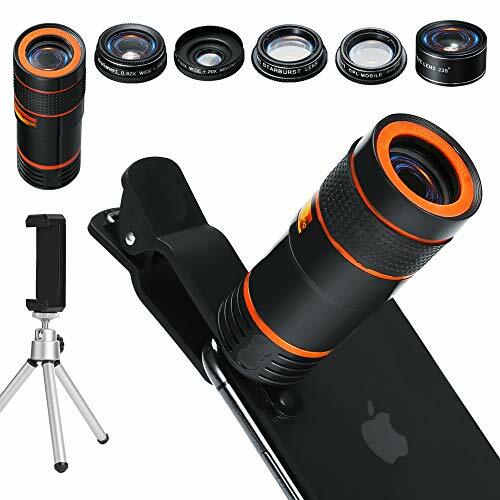 Our Smart phone camera 6-in-1 lens kits enhance camera capacity and create marvelous pictures. It's easy to put in the pocket and go out for fun! No pass it. - Wide Angle lens can shoot larger range of scenery. Macro lens can take clear photos of small objects. - The viewing range is farther, the image is clearer and the vision is wider. - Enables funny circular pictures shot, takes you into a stunning fantastic world. - Make the lights all come to life like magic with star filters. - With the zipper bag for storage and carry. Fit for iPhone, Samsung , Android and most Smart phones. ▶6 Most Popular Lenses in 1 Kit: There are 5 professional lenses with 6 powerful features - 12x zoom, 235° fisheye, 20x macro & 0.62x wide angle, starburst, and CPL, meeting all your demands and letting you instantly share incredible photos on social networks!